the mayor of Moscow is insulting your memory! were the slogans of the demonstration in front of the Russian Embassy in the Swedish capital on March 2. 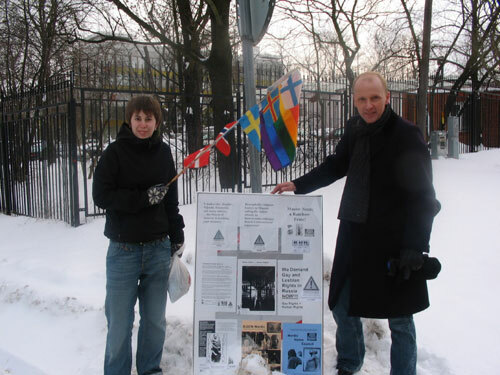 Arranged by Tupilak (Nordic organization of lesbian & gay cultural workers), the Nordic Homo Council, and ILGCN (International Lesbian & Gay Cultural Network) Information Secretariat in Stockholm, the event was also attended by a representative of the youth section of the national Swedish LGBT rights organization, RFSL. It was part of an international protest requested by IDAHO (International Day Against Homophobia) against the mayor of Moscow banning Pride and was part of an international action carried out the same day in London, Paris, Vienna, Warsaw and other cities. There has been no response to an earlier Tupilak letter to the Russian ambassador requesting a dialogue especially concerning the safety for Nordic delegations to be sent to the 1st stage of the ILGCN world cultural conference scheduled for Moscow on May 25  helping launch the 1st IDAHO world conference and the Moscow Pride on May 27th. 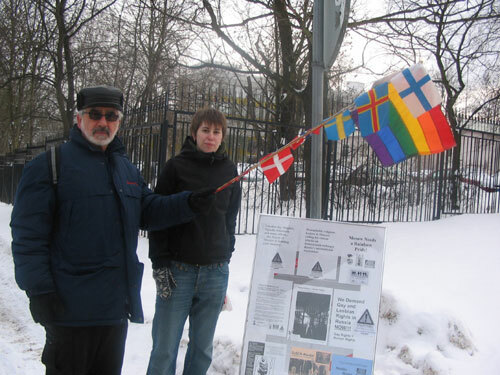 The only sign of life from the embassy was the appearance of a security official who asked the police monitoring the demonstration to move the protestors, their posters and rainbow and Nordic flags further down the snow-covered street  away from the embassy gate. Passers-by praised the demonstration and sent greetings to homosexuals in Moscow. The demonstration was covered with live broadcasts both on local and national radio  including the mentioning of the appreciation e-mailed by Moscow colleagues -- and photos appeared in two of Stockholms morning newspapers the next day.